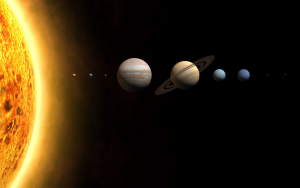 Of the approximately 100 billion solar systems1 in the milky way galaxy, our solar system consists of eight planets that orbit the sun. 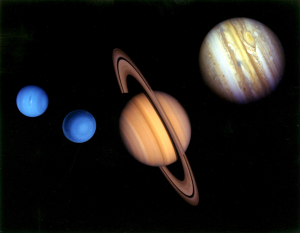 The outermost planets consist of Jupiter, Saturn, Uranus, and Neptune. These planets are known as “Gas Giants” and are often referred to as Jovian Planets2 because of their chemical components. However, due to their extremely cold temperatures and large accumulations of ice, Uranus and Neptune are typically paired together and are commonly known as “ice giants”. Perhaps the most interesting aspect of these two planets is that Uranus and Neptune both have very similar surface temperatures, despite the fact that Neptune receives far less solar insolation. Both planets also radiate more energy than they receive from the sun; this is especially true for Neptune. Very much like the other Jovian planets, Uranus and Neptune’s upper atmosphere consists of a mixture of hydrogen and helium gas. However, it is interesting to note that the icy mantle right below is made up of not only ice water, but ammonia and methane ice crystals3 as well, giving these planets their distinctive blue colors. There are several planetary factors that come together to determine the surface temperatures of Uranus and Neptune. The primary reasons for their similar cold temperatures is due to their limited solar insolation which is inversely proportional to the planet’s distance from the sun and their thermal emittance. 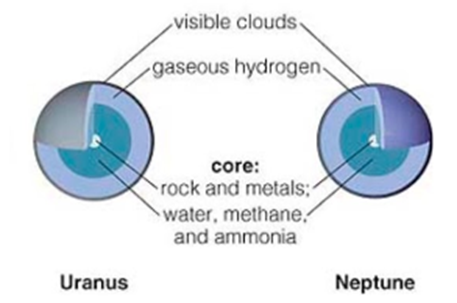 We will be examining these factors in great detail to show how they contribute to Uranus and Neptune’s extremely similar surface temperatures which allow them to be grouped together as “ice giants,” as well as the possible causes and implications of the fact that their surface temperatures are so similar, in spite of Neptune receiving much less solar insulation. We will also demonstrate how scientists and astronomers have come to know such information. By doing so, we can gain a deeper understanding of the ice giants, which would be useful in understanding the planetary energy systems of similar planets. The practical implications of such research become apparent when considering the possibility of further space exploration, as these are the outermost planets, making them ideal for launching missions beyond our solar system. Unfortunately, since there has only ever been one flyby, performed by the Voyager 2, little is known of the planets Uranus and Neptune. Earth orbiting satellites such as the Hubble Telescope have played an integral role in making observations about the two planets. The data collected from these satellites can be found on the NASA website, and the numerical values are presented here, along with detailed diagrams and explanations that explore the planetary variables that have led astronomers to conclude that Uranus and Neptune are both icy, as well as gigantic. Uranus and Neptune are indeed ice giants. 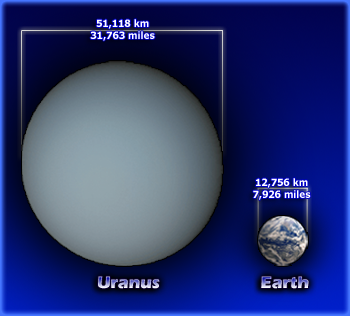 Uranus is nearly 4 times bigger than the Earth and roughly 14.5 times heavier. 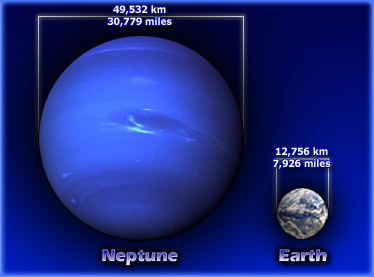 Neptune on the other hand is 3.8 times larger than Earth but 17 times heavier, which suggests it is slightly more dense. Although they are much larger and heavier than the Earth, their respective densities are only 23% and 29% of that of the Earth. This is because a large portion of them are light elements such as helium and hydrogen that are in a gaseous state, whereas a much larger portion of the Earth are made up of heavy elements in a solid state8. Most planets within our solar system use solar insolation as their main source of heating. Uranus and Neptune are significantly further away from the sun than other planets in our solar system. When compared to Earth, Uranus is 19 times further away from the sun while Neptune is 30 times further from the sun. Therefore they only get a portion of the solar insolation that the Earth receives. Uranus only receives 0.27% of what Earth receives while Neptune only receives 0.11% of what Earth receives. Neptune and Uranus are clearly shown to receive only small amounts of heat from the sun compared to the closer planets in our solar system. Not only do their distances from the Sun limit their solar insolation, the refraction of light from the gasses and ice also lower their actual levels of solar insolation but to a lesser degree. These factors play an influential role in the planet’s very low surface temperatures. These low surface temperatures combined with high pressure will turn a gas planet into an ice planet. The difference in incoming solar insolation suggests that the two planets should vary immensely in surface temperature and thus structural composition. If this were true, It is not likely that they would be grouped together as “ice giants” when looking at our solar system. However, Uranus and Neptune are very similar in both cases. To explain why, we must look inward. Table 3. Mass and density information comes from analysis of Voyager 2 flyby data. As shown in the table above, Uranus and Neptune are similar in mass and density12. Additionally, their bulk compositions and internal structures are both fairly similar13, 14. However, the amount of sunlight that reaches Neptune as discussed earlier is only 40% of what Uranus receives; this is due to its increased distance from the sun. Despite this, the surface temperature of the two planets have been estimated based on thermal imaging to be nearly the same at 59K12. Neptune is thought to have substantial heat flow coming from within, which helps to compensate for its lack of solar insolation. This heat flow would radiate 2.7 times more energy that it receives from the Sun, which helps to increase the temperature both on its surface and in its atmosphere15. To find evidence of such a phenomenon, we must look inside the atmospheres themselves of the two planets. For the purpose of analysis, researchers treat the atmospheres of Uranus and Neptune as envelopes of hydrogen-helium that come in contact with solar radiation and are readily observed by orbital remote sensors12. 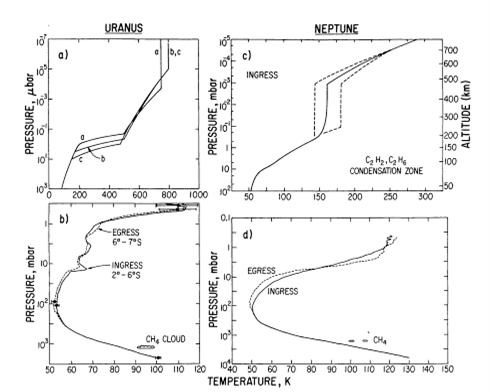 The figure above compares the temperature profiles of both Uranus and Neptune with their respective atmospheric pressures. The atmospheres are broken down into three distinct sections, much like the Earth’s atmosphere, except the Earth’s has four sections (Figure 2). Uranus and Neptune possess, from low to high, a troposphere, stratosphere and thermosphere but lack the Earth’s mesosphere. 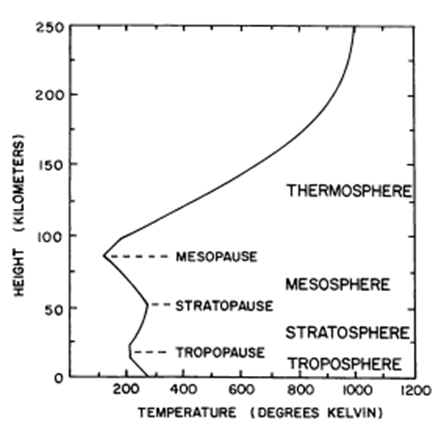 The troposphere and stratosphere are separated at 0.1 bar by the tropopause. Above the stratosphere is the thermosphere. These two are divided by the mesopause which is roughly 10-5 mbar. The uppermost portion of the atmosphere shows a large difference in temperatures between the two planets. Uranus has a temperature of 800 K, whereas Neptune has a temperature of 300 K. This is due to the larger accumulation of incoming solar radiation on the planet Uranus. As the insolation enters the stratosphere, the temperature rapidly declines as solar insolation diffuses and scatters on the elements held within the atmosphere18. Midway through the troposphere, there is a rapid increase in the temperature of Neptune of nearly 80 K compared to Uranus’ increase of roughly 50 K. This suggests that Neptune is radiating more heat than Uranus from an interior source. According to analyses of primitive asteroids and the sun, the most abundant secondary molecules on these planets next to helium are expected to be Carbon, Oxygen and Nitrogen. Through the use of a spectrometer, scientists are able to generate an absorption pattern for the light coming from a particular planet. Since we have measured the absorption pattern for all known elements on Earth, we can compare them to the planet’s absorption pattern to determine which elements are present20. By analysing this electromagnetic spectrum data from ground based satellites such as the Hubble Telescope, Uranus and Neptune’s atmospheres are thought to be composed primarily of Hydrogen and Helium. This abundance of Hydrogen allows Oxygen to produce water (H2O), Nitrogen appears in the form of ammonia (NH3) and Carbon is thought to produce methane (CH4). (Figure 3). These molecules are what cause the diffusion and scattering as mentioned above. All three of these can appear as ice on the planet’s surfaces due to the immensely cold temperatures and high pressures12. Methane’s ability to readily absorb red light while effectively reflecting blue and green light is the reason these planets appear to have a blue-green color. Further evidence for large thermal emittance in Neptune resides within its weather patterns. 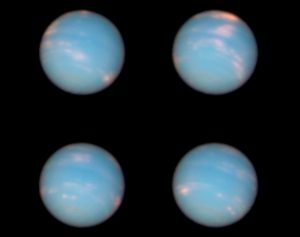 Neptune is the furthest planet away from the sun but exhibits some of the fastest moving winds which produce the strongest storms in our Solar System. Figure 7 shows four images of Neptune taken just hours apart. As you can see, the cloud cover moves with immense speed across the planet. With less energy coming from the sun, it is believed that the core heat being emitted plays a primary role in producing these storms and winds21. As stated previously, to have increased thermal emittance Neptune must have a warmer core then Uranus. However, the core temperatures of Uranus and Neptune cannot be measured directly, so we must infer this information from other sources. Some of these sources include: surface temperatures, surface features, which may suggest a particular geologic history, and theories of origins of and evolution of the planets22. Through careful analysis of orbital satellite data, Nasa was able to estimate the current core temperatures of Neptune and Uranus to be 7273K21 and 5000K23 respectively. Uranus and Neptune, the two outermost planets of our solar system, are among the four gaseous Jovian Planets. From what we have learned after examining their chemical compositions, solar insolations, and their internal core temperatures is that their most distinctive features are their similarly cold temperatures, and their enormous sizes in comparison to the other planets in our solar system. Thus, they have been appropriately grouped together as the two “ice giants”. It has been clearly shown that there are multiple factors that contribute to the two planets having similar surface temperatures, even through Neptune receives much less solar insulation than Uranus. Among the most important is Neptune’s warmer core, which allows it to radiate more energy. All that we know about them stems from the advancements in technology that have permitted the creation of the Hubble Space telescope as well as the Voyager 2 spacecraft and the resulting discoveries and inferences we have made about them using data collected from the aforementioned sources. There is still much left to explore, and perhaps through working with the current knowledge we possess, in the near future we may be able to determine a way to actually explore these planets and even those further than our own solar system at a closer range. Doing so would allow us to prove many of the current theories surrounding these planets through direct measurement of the variables involved. 1S.P.A.C.E Staff. “100 Billion Alien Planets Fill Our Milky Way Galaxy: Study,” Search for Life, 02 Jan 2013, http://www.space.com/19103-milky-way-100-billion-planets.html (20 Feb 2017). 2The Economic Times, “Definition of ‘Jovian Planet’,” Space Technology, 2017, http://economictimes.indiatimes.com/definition/jovian-planet (02 Mar 2017). 13W. B. Hubbard, W. J. Nellis, A. C. Mitchell, N. C. Holmes, S. S. Limaye, and P. C. McCandless. “Interior Structure of Neptune: Comparison with Uranus.” Science 253 (5020), 648-651 (1991). 14M. Podolak, R. T. Reynolds, and R. Young. “Post Voyager Comparisons of the Interiors of Uranus and Neptune.” Geophysical Research Letters 17 (10), 1737-1740, (1990).